Sandford Bone China Pottery Bell - Antique Bone China Query: Please can you help. I am setting up a display of some of my bell collection for an event and I am trying to obtain information about various bell makers .. foundries and potteries. I have a bell which is printed inside with a crown over the words 'FINE BONE CHINA' between this is the word 'Sandford' (this is written in pink). Beneath this are the words 'MADE IN ENGLAND' and there are 2 sprigs of leaves. Any information about the company would be much appreciated. I understand your problem in finding information on Sandford Bone China Pottery or its ceramic marks. There is virtually nothing on the net and no mention of Sandford Bone China Pottery marks in my weighty ceramic marks tomes and porcelain markings encyclopedias. The only thing we can go by, therefore, is anecdotal memories of people who remember the pottery. These are by far the best type of research when looking into the history of antique bone china manufacturers. From the information I have gleaned, the pottery, based at Wareham in Dorset, closed in the late 1960s. The Sandford bone china pottery was housed in a majestic Victorian building (see above), dating from 1866. You can read a full account of it here http://www.dorsetlife.co.uk/articles/print.asp?ID=535 an article written by Hugh Elmes whose father worked at the pottery as a maintenance engineer. 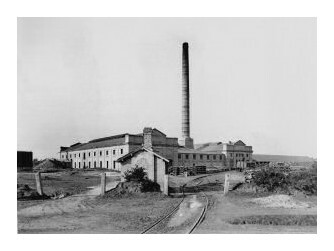 The general works were powered by a steam power whilst the kilns were powered by coal. Interestingly, the steam power continued up to the 1950s. Tramps used to sleep near the warm kilns. Sadly, the pottery works remained as an empty shell until 1979, when a housing estate was built on the brownfield site. The author of the article, Hugh Elmes, wrote the following poem about the Sandford pottery. HI there. I just purchased for .25 cents a piece of Sanford bone china that is shaped like a wooden shoe with a little santa claus face on the top of it. I came on here to see what I could find out about Sanford only to find it's closed. Thank you for putting that on here because at least I know. In 1861 (census) 4 Potters from Stoke upon Trent were working in Sanford Pottery, John Dennis, James Guest, Samuel Taylor and Simpson Bagley.They all lived in Mill Lane Wareham, one being my ancestor, I too have been trying to find out more about this pottery. I have a piece of my mothers (I was born and raised in the U.K.) However this piece is not bone china,it is heavy duty ceramic ware. Has Sanford, England on the bottom. It is like a vase but made to hold a bunch of CELERY. It is a strange green colour and it looks like a bunch of celery with a funny face on it. The word CELERY if over the face. This must mean that the company made other pieces beside Bone China. It is old. What do you think the value is. There is no danage to it. To the best of our knowledge the big Sanford Pottery only made what might be called industrial pottery. On the opposite side of Sandford Road there was a small pottery called, we think, Sibley Pottery. They sold bone china and may well have made it there, it had a two story structure resembling an oast house. More recently it was a tea room. My great, great grandfather Thomas Austin born in Tunstall worked at Sandford and lodged with a David Pool and his family.i would be interested to find out more information about the potters who moved from Staffs to Dorset.